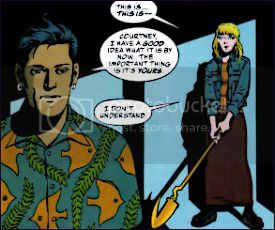 Author's Notes: Requestor suggested Courtney interacting with Jack Knight and their last scene in "Starman" still makes me go all weepy. I never ever thought I'd write Courtney though. I'm on a train to Opal City and I don't even have a clue why. But I've been taught even to use the minutest of details to figure out a problem. Mysteries are like algebra equations – the answers seem simple once you've solved it down to its lowest levels. It started with a phone call out of the blue. I hadn't heard from him in months. None of us had, but it was understandable, given what he had experienced. All the same I was the last person I expected him to contact. The phone rang after dinner. I wanted anything out of the cleaning the dishes, so I yelled "I'll get it!" over my shoulder. At this hour, I knew it was probably some marketing person or worse that crummy math teacher, but it was a delaying tactic. "Whitmore-Dugan residence." "I'm glad I caught you, kiddo. I was hoping you weren't out fighting some zombie thief." I groaned, recognizing the voice. I think I would have preferred the math teacher or the telemarketer. Why was Jack Knight calling me on the phone? Don't superheroes have their own calling plan? "What do you want, Jack?" "I was wondering if you could come to Opal City." "Is there some sort of trouble?" I asked immediately. "Should I tell the others?" "No, no, you're all I need on this one." "You have your choice of heroes and you want me?" "Will you just trust me this time, Court? I can't explain over the phone. You can take the train. Your mother won't have anything to worry about. You know I wouldn't ask unless I thought it was important." He had me there. Say what I would about Jack, but he really was a good guy. A pain sometimes, but he usually had his heart in the right place. I did have a long weekend coming, but I hadn't planned on spending it in Opal City. "I'll talk to Mom. If she's okay with it, I'll come down next weekend. Is that okay?" I paused, expecting to hear a complaint. "That's fine. It'll give me time to finish up some stuff here." Mom did need some convincing to let me go. She always worries about me getting hurt, even more with little Patricia to think about. Even Pat was worried. He was ready to suit up the minute I mentioned it. I told him I wouldn't need the suit, but he convinced me to pack it anyway. "You never know when it'll be needed." At least I wouldn't be flying. I didn't want to think about getting the cosmic converter belt through security. As I replayed that phone call again, it occurred to me how cryptic Jack had been. Jack sounded good. He cracked jokes like usual, but he was different. I'd be different too, if I'd experienced all he'd gone through. But I still didn't get it. What did he want with me? Usually Jack went out of his way to annoy me. But now insists that I have to come to Opal. He doesn't give me any idea why, just that I needed to trust him. What was so important he couldn't tell me over the phone? I wasn't that great a detective, but something smelled fishy. I hadn't seen Jack since the memorial service for his father. He's stayed out of sight since, not that I blame him. Losing his father must have been pretty rough. I can't even imagine how that feels. If I lost Mom, I'd be a wreck. Even if I lost Pat, I don't know how I'd cope. They're my family, they're what I have. I've seen how others managed, how they couldn't see past the pain and anger. I've seen how Al wanted to tear apart a world to change things. But would I really be any different? Sometimes with everything I've experienced, I forget I'm just a kid. Most teenagers don't have to think about life or death issues. All my friends have to worry about is whether they'll have a Homecoming date or if they'll pass the SATs. They don't have to think about some bad guy trying to fry their brains out. They don't have to worry about their family becoming targets. Jack was waiting for me when I came off the train. He looked content, like he had finally figured out the great meaning of life or something. Hard to believe this was the same guy who never took anything too seriously a few years ago. He didn't talk much on the way, just small talk. He asked about my little sister. He looked far away when I mentioned all the silly newborn baby things she was doing. He was leading up to some great announcement, but I couldn't figure out what. "I have something for you," Jack began. I should have realized he wasn't joking around anymore. He was acting so un-Jack-like, I should have known something was up. Even so I couldn't have predicted what he did next. He handed me his Cosmic Rod. He practically just dumped it into my hands. I was too stunned to speak straight. "This is... this is..." I'm sure Pat would be floored that I was tongue-tied for once. It takes a lot for me to be at a loss for words. "Courtney, I have a good idea what that is by now. The important thing is it's yours." Mine? He wanted me to have his Cosmic Rod? But he was Starman. He was a Knight. "When we swapped ages... me and the JSA were kids and you were grown up... I wasn't so young in the head I didn't notice how you acted. Your wisdom." I remembered that weird adventure. I was suddenly the one making the decisions. I was the one trying to be the adult one, rather than the irrepressible kid hanging around her grandparents. I never told the others I sometimes felt like that. Fitting in and belonging are two different things. I guess I'm just surprised Jack noticed. "My father would have been proud of you," Jack said. That made me feel good. I liked his father. Mr. Knight was willing to help me with the cosmic converter belt. But more, he didn't make me feel like a dumb kid. But it was still a lot to ask of me. I was so new at this business. I barely felt like I was treading water sometimes. "I'm not sure, Jack. I'm still learning to handle the powers I have." He had an answer for that too. The more he talked the more I realized he had really thought this through. He wasn't going to turn back either. The rod was mine when I was ready. 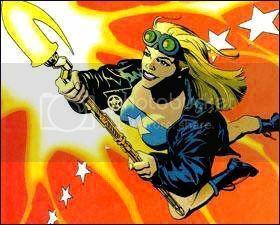 For good measure, he handed me his jacket and his goggles to be "as much of a Stargirl as I wanted to be." There was no question I wanted to be her. Our little age shift had given me a glimpse of my future, if I continued with the super-hero business. I wasn't a kid anymore. But I'd also seen what happens when you rush things. So that future would have to wait until I was really ready. I tried to figure out what to say. So I voiced what I'd been thinking all the way on the train. "I've never been sure you really liked me." Jack gave me this look, "I've never been sure myself." Then he shook his head. "No, that isn't true. As corny as it sounds, you remind me of me. Brash as me." I'd never thought of it in those terms, but Jack was right. We were more alike than we wanted to admit. Maybe that was why we grated on each other so much. He puts up such a strong front. No one sees past that bravado and the wisecracking, except his father. "Difference being, I wasn't nice. I wasn't a hero. I was bad news." I could have said the opposite but I doubt he would have listened then. He wanted to walk away. He was ready to put that life behind him. "You're 24 carats, baby. As bright as the sun." I think I blushed when he said that. "Seeing that made me feel... whatever I may have thought of you, I've had time to reconsider the matter," Jack said. "Courtney, if you accept this, you honor me." I don't make promises lightly. I had a lot of time to think about the decision while he was talking. Hearing him, how he saw me, I remembered those moments when I wielded the Cosmic Rod myself. Could I do this? Could I be that golden girl he saw? "I'll be the best I can." I fully intend to live up to that promise someday. I'll make them all proud of me. I've got one hell of a legacy to live up to. But if anything I've learned from being around the Justice Society, it's that family and legacy are what superheroes are all about. It's why you fight so hard when the chips are down. What you do now in the present impacts your future and your future's future. Now I'm in that heady group and it feels so dizzying. But if Jack thinks I can carry on in his father's footsteps, then I'll be the best damn Stargirl... no... Starwoman anyone has ever seen. And they better hope they're ready for me. Reference images taken from STARMAN #80.